More and more of us are practicing our passes on plastic pitches. Artificial turf is now a regular fixture for rugby, football, tennis and hockey matches and is great for playing in all weathers. But black granules in your boots is a common complaint for plenty of players. Is there a plastic pollution problem right under our boots? Fidra’s Pitch-In project has been looking at the impact of plastic pitches. We’ve created guidelines on how to keep these granules or infill on the pitch. Some of that infill is made from end of life tyres, prompting concerns about health impacts. But why are tyres used and what’s the latest evidence regarding health and environmental concerns? How big is the end of life tyre problem? Tyres are a cradle to grave environmental problem; from the fossil fuels used in production, through the microplastics generated via wear and tear, to their eventual disposal. 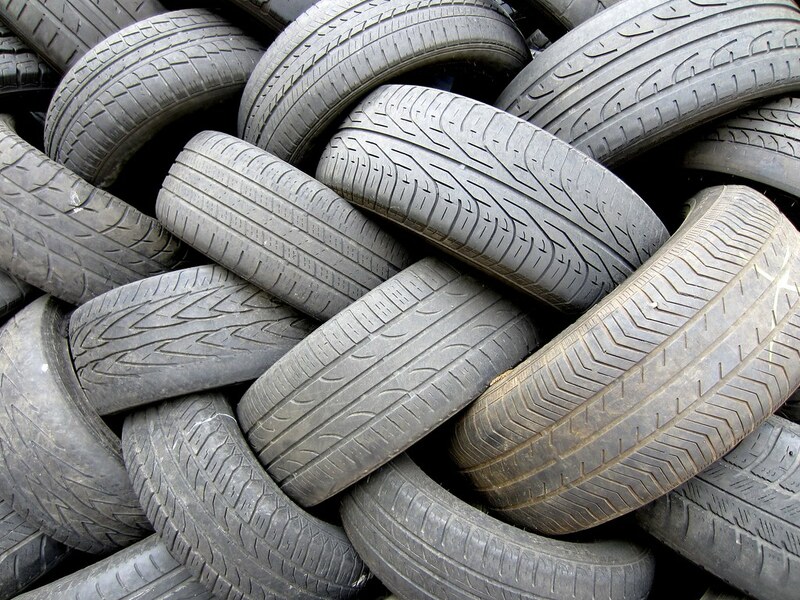 Did you know that a billion end-of-life tyres are generated globally each year? Most tyres only last a few years before being dumped. 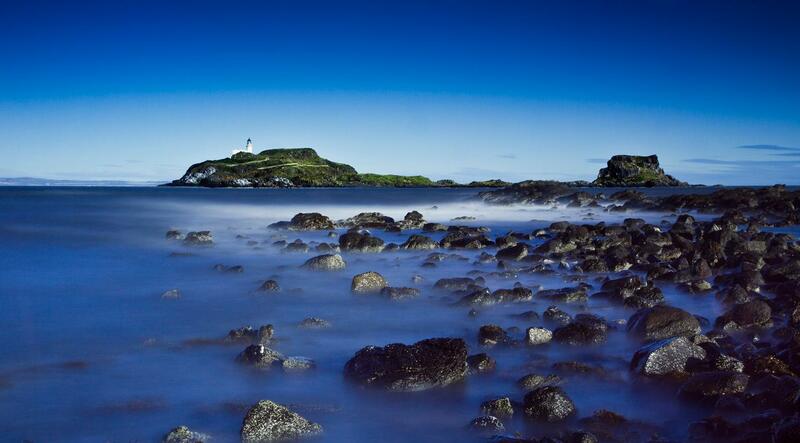 In Scotland alone, 100 tyres are turned into waste every 15 minutes. Therefore, with tyres rightly banned from landfill in the UK due to leaching of heavy metals and toxins into the water table, their lawful disposal is a significant problem. In addition, illegally stockpiled dumps also threaten the environment and pose a major fire hazard, further risking health of individuals in the path of the smoke plume. From re-use to recovery there have been a whole host of different solutions put forward to deal with end-of-life tyres, including carpet underlay, surfacing for children’s playgrounds and – sports surfaces. What have tyres got to do with artificial turf? Artificial turf often requires a ‘performance infill’ to ensure a surface that gives good playing quality. The variety of infill available is wide, from granules created from virgin polymers to natural infills made of cork or coconut husk. The list of solutions doesn’t stop there and in fact, recycling end-of-use tyres is now the most commonly used material to create the performance infill used on 3G artificial turf pitches. That’s right, those little black granules that you find in shoes and socks when you play football or rugby on artificial turf are likely to be ground up bits of old car tyre, known as SBR (styrene butadiene rubber) or rubber crumb. This infill is used to create a cushioning and act as a stabilising base for the plastic grass blades. Over the past few years concerns have been raised regarding the health impacts of SBR from end-of-life tyres and the fact that they can become a source of microplastic pollution if they escape the pitch. 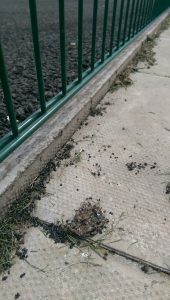 Rubber granules found on the outside edge of a football pitch. They are loose and able to escape into nearby soils and drains. At Fidra, we are concerned that this infill (also a microplastic) is making its way into the surrounding soils and waterways at high levels, carrying along with them the chemicals that are part and parcel of the infill (see below). It’s estimated that up to 72000 tonnes of microplastics are lost from artificial turf pitches across Europe each year. Along with the predicted rise in artificial pitch use and the potential environmental harm caused by leaching of chemicals in infill, this presents a significant environmental issue. That’s why, along with our friends at KIMO International, we have produced a Best Practice Guidelines for the use, design and management of sports pitches. We are working closely with procurement professionals, local communities and providers of 3G pitches across Scotland and Europe to address this issue. We have also been working on a community toolkit which helps local users and owners of 3G pitches reduce the loss of these granules to the environment. But is there a heath issue? SBR is the subject of media coverage due to potential health concerns as it contains a variety of hazardous substances (including PAHs – Polycyclic aromatic hydrocarbons, metals, phthalates, and VOCs – volatile organic hydrocarbons). PAHs are a large group of chemicals and are well known as carcinogens, which at certain exposure levels can pose a threat to the health and well-being of humans. But do we need to be worried when it comes to playing football on the local 3G pitch? Do these substances leach out and expose players to harmful levels of these toxins? Further evidence regarding health is expected from USA studies later in 2019 and ECHA have confirmed that they will continue to look at the health and environmental impacts of other substances contained in these granules. What are the health recommendations with SBR granule pitches? Change REACH Regulation to ensure that rubber granules are only supplied with very low concentrations of PAHs and any other relevant hazardous substances. Owners and operators of artificial pitches should measure and publish the concentrations of hazardous substances. Producers of rubber granules should develop guidance on testing their material. European sports associations and clubs should ensure that health and safety information about synthetic turfs is communicated to the players and public. Owners and operators of indoor artificial pitches should ensure adequate ventilation. They also suggest users take basic hygiene measures, by washing their hands of the problem – literally not metaphorically. Please do wash your hands and still Pitch-in! We have submitted a response to the ECHA consultation on restricting the sale of granules that contain PAHs above a set concentration limit, for use as infill material on synthetic turf pitches, with this information in mind. At Fidra we’ll be keeping an eye out for the new studies from the US and for innovations in technology that may reduce microplastic loss and environmental health concerns, so that you don’t have to. The wheel literally does need to be reinvented but until then, end of life (not to mention during life) tyres are a huge environmental conundrum. If you want to do something to reduce the environmental harms from this and other microplastics on artificial turf pitches there are a number of things you can do. Why not sign up and Pitch In to help us reduce microplastic loss from pitches? Ask your club, maintenance contractors and your team to check out the Best Practice Guidance to prevent microplastic loss. Could you encourage them to follow the ECHA recommendations on health? Find out more on how you can help at www.team-pitch.in. Investigating options for Reducing Releases in the aquatic environment of microplastics that are emitted by (but not intentionally added in) products. Eunomia 2018.